The Emmys, am I right? Seriously, when you’re an hour and a half into an Emmy telecast and you’re thinking, “Bachelor In Paradise might have been a better choice,” then I think it’s time either to reconsider our masochistic interest in this awards ceremony or to give Bachelor in Paradise its due credit. For now, let’s go with the first option. I mean, I haven’t dabbled excessively in animal husbandry, but I can’t help but shake the fact that watching a four hour documentary on the herding patterns of yaks would’ve proven more exciting than this year’s recipients. Repeat winners ruled this particular Seth Meyers-led roost, furthering the perception of the Emmys as little more than a popularity contest, which–of course–it is. But look, before you get all bent out of shape and start creeping under my house’s crawlspace, I can confess that Breaking Bad‘s several wins were not only deserved but also requisite accolades for a brilliant conclusion to the best show ever to appear on television. Still, its victories added to the overall sense of humdrum boredom and expectation. In addition to the been-there-done-that feel, several weird choices–and I’m not just talking about awarding Kathy Bates for her kitschy, over-the-top performance in American Horror Story: Coven over the all-but-a-lock Allison Tolman of Fargo–created a rushed, slipshod ceremony. For instance, why were there lengthy clips for the nominees in the Best Supporting Actor in a Drama category but just live audience reaction shots for Best Actor? Why were some presenters given free rein to riff before announcing the winners and others just read off the teleprompter? The Emmys felt surprising in all the wrong ways. I was scared, I was confused, and Tatiana Maslany wasn’t there to hold me. I didn’t like it. And yet, somehow, the occasional bright spot punched through the murkiness of the proceedings, so below I’ll highlight those (spoiler: it’s a short list) before limiting myself to my major complaints and snubs. Seth Meyers didn’t set the world on fire or anything as this year’s host, but several very funny interstitial segments did delight. My favorite has to be Billy Eichner (aka Craig from Parks and Rec) and Seth Meyers on the streets of New York interviewing unwitting pedestrians about the Emmys in this special installment of Billy on the Street. I laughed so hard when Billy scampered away after decrying a Mindy Kaling snub in light of her waking up at the crack of dawn to announce the nominees: “You know who slept soundly? Perennial Emmy nominee JULIE BOWEN!” And how about Billy’s reaction to the guy who confused Seth Meyers for Seth MacFarlane? Great stuff. My second favorite bit involved Seth opening the floor up as a Q&A, leading Jon Hamm to claim Maggie Smith’s Emmy–if she won– before Julianna Margulies could, Andre Braugher looking for the bathroom key (hint: Josh Charles had it! ), and Fred Armisen whipping the crowd into a frenzy in hopes that the Emmys could televise “every year.” All participants were game here, and it worked. Loved it. Finally, the Bryan Cranston/Julia Louis-Dreyfus moments, culminating in him ambushing her in an aggressive lip lock, helped us fall in love with these two even more. Sure, the songs weren’t particularly great (though spurring George R.R. Martin to “write faster” over the Game of Thrones theme amused me), but WEIRD AL PERFORMED AT THE FRICKING EMMYS! #win. Before doling at some award or other, Jimmy Kimmel absolutely killed it in his comedic lambast of Matthew McConaughey, urging him to pack up his patchouli oil and hit the road among other choice one-liners. Well done, sir. Julianna for The Good Wife (and then tossing out a reminder that her show still produces 22 episodes a season). Louis C.K. for writing “And So Did the Fat Lady.” Surprise wins for Benedict Cumberbatch and Martin Freeman on Sherlock. Fargo claiming Best Miniseries. Breaking Bad doing its thing (though I have–please forgive me–a quibble about Aaron Paul’s victory, which you’ll see in a second). Other than that, not much. Billy Crystal nailed it, keeping it short and sweet as he painted a beautifully personal portrait of his deceased friend with a few choice anecdotes. And if the clips that played after Crystal spoke didn’t leave you with a lump in your throat, then I don’t even know what to tell you. Ty Burrell won AGAIN. The show won Best Comedy Series AGAIN–for the fifth time in a row. Gail Mancuso won for Directing AGAIN–for the second time in a row (though her submission episode, “Las Vegas,” was hilarious and so well-deserved). Look, I still enjoy this show a lot, but let’s move on. Please. I don’t even want to talk about this, except to say it’s another instance of name recognition trumping fresh-faced, genuine talent, though–to her credit–Kathy Bates looked genuinely flummoxed when she heard her name called. Julia Louis-Dreyfus won her third consecutive Emmy and Bryan Cranston his fourth total last night, but they’re brilliant, so I’ll posit them as the exceptions. Still, they’re a part of a catalogue of performers who claimed victory already: Jessica Lange (snooze), Jim Parsons (eye roll), and Ty Burrell (scoff) to name but a few. I’ll say it again: let’s move on. I love Aaron Paul. He’s exceptionally talented, and he consistently elevated Jesse Pinkman into a fully formed, robust character about whom we cared and for whom we cheered. Still, that trophy belonged to Josh Charles for his swan song episodes of The Good Wife. Charles had more to work with this year than Paul did–sorry, but it’s true. I don’t begrudge Paul his victory (as I said, love the guy), but it would have been nicer to see Charles add that first trophy to his shelf instead of Paul adding his third. Sorry, but this was weird. Key and Peele tried to make us care with their funny self-deprecating bit and–a credit to their profuse talents–almost succeeded, until I remembered they were introducing accountants. Um, what? For his performance as police captain Holt, Braugher proved the power of the “straight” man comedic trope; by underplaying his character amidst a squad full of loonies, Braugher emerged as the funniest member of the hilarious Brooklyn Nine-Nine cast. Ty Burrell, funny as he is, plays a dimwitted dad–that’s the work of a two time Emmy winner? I’m not sure where it could have squeezed in, but it’s a shame that this show continues to gobble up the nominations but does not convert them into victories. Now that Breaking Bad‘s era has concluded, maybe the time for GoT is finally upon us! Until next year, you Emmy masochists you! Author Overstuffed DVRPosted on August 26, 2014 August 28, 2014 Categories NewsLeave a comment on Emmy Reaction, or Um…What? In light of the horribly shocking news of beloved comedian Robin Williams taking his own life at the age of 63, many fans have been offering up their favorite performances of his over the years. For millennials such as myself, Williams was a staple during my childhood and adolescent years: Aladdin, Hook, Flubber, Jumanji, Jack, Dead Poet’s Society, Mrs. Doubtfire, Bicentennial Man, and even Patch Adams hold particularly special places in my heart for that very reason. 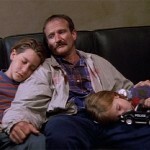 As I grew older, titles like Death to Smoochy, One Hour Photo, What Dreams May Come, The Final Cut, World’s Greatest Dad, The Fisher King, and Insomnia allowed me a peek into the darker places Williams dared to take his characters, whether dramatically or comedically. And yet, while all of these–and more–stand out when I think fondly of Robin Williams’s impact, two television performances of his continue to resonate with me, the two pieces of art that I find myself continuing to gravitate back toward. If you’ll permit, I’d like to share them with you now. Even if you’ve never seen an episode of this all-time great crime series (a progenitor of The Wire amongst many others), it should not stop you from seeking this installment out immediately. Williams plays Robert Ellison, a tourist on vacation with his wife and two children–one of them played by a very young Jake Gyllenhaal–in Baltimore. After getting turned around and winding up in one of the more unsavory sections of Charm City, Robert is utterly helpless as he watches his wife murdered in front of him. For the remainder of the episode, while the police do their best to track down a killer and stave off the pressures from City Hall, more concerned about plummeting tourism than the loss of a wife and mother, we have an opportunity to zero in on the effects of grief on a shattered family. 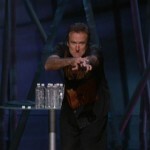 A truly unique concept for a crime series (particularly at the time of its original broadcast in 1994), “Bop Gun” became a powerhouse showcase for Robin Williams and earned him a Guest Actor in a Drama Series Emmy nomination that did not–of course!–convert into a win. As he takes Robert through the myriad stages of grief while trying to balance the newly anointed role of single father, Williams probed depths of despair and sadness that–in light of the current news–must have been pulled from his own struggles. It’s a haunting performance, one of the best by a guest actor in a series that helped to pioneer brilliant guest performances, but more than that, it serves as a testament to Williams’s profuse talents. We may know him primarily as a deft whirligig of a comedian (more on that in a second), but his spellbinding performance in “Bop Gun” showed layers of such nuance that it became clear that we still hadn’t seen all that Robin Williams had to offer. Somehow, he still had tricks hidden up those sleeves. The first time I watched this mind-blowingly brilliant HBO stand-up special, I don’t remember ever having laughed for such an uninterrupted period of time. In truth, I haven’t since. Williams’s madcap ribaldry came at such a frantic and relentless pace, my friend and I had to pause to catch our breath from laughing. If we hadn’t, our wheezing paroxysms of laughter would have drowned out a zippy one-liner or an off-the-cuff self-deprecating rejoinder. The man was on fire, a routine that seemed so effortless and spontaneous that it could only be the work of a diligent, well-rehearsed professional. My senior year of high school was a difficult time, but Live on Broadway genuinely shone a light into the dark period of my life. Unabated, unapologetic laughter poured out of me as if to purge the negativity and sadness I’d been living with: a comedic exorcism. As tears streamed down my face and Williams went off on Olympic sports (“The luge? What f*****-up German gynecologist came up with this sport?”), religion (“But, for the Last Supper, would they have not gone out for Chinese?”), world issues (“Osama Bin Laden is a six foot five Arab on dialysis. What is so ******* hard to find?! ?”), and celebrities (“Michael Jackson’s claiming racism? I’m like, ‘Honey, you need to pick a race first. '”), I felt for the first time the truly healing nature of comedy. For that, I’m truly grateful. Even to this day, I find that snippets of Williams’s routine have insinuated themselves into my day-to-day lexicon, and what does that indicate if not a gift given by a performer at the height of his power? Nominated for five Emmys but–of course–winning none, Live on Broadway remains the gold standard for me. Thank you, Robin Williams, for being so generous in sharing your profuse talent. You helped me through my own depression at a time when I needed it; I only wish someone could have done for you what you so miraculously did for me. Rest in peace. It hasn’t been the best summer for movies. There, I said it. Sure, there have been some great ones peppered throughout the season, which now stretches as far back as April and lasts into September, but I can count on one hand the number of films that I felt truly pumped to see. Fortunately, August seems poised to become the new July, with a crop of anticipated flicks scheduled for release in the coming weeks. Thanks for reading! Part II out by summer’s end! As the dog days of August threaten us with late-summer malaise and our DVRs verge on starvation, you might be sitting at home, carving hashmarks into your wall as you count up to the impending whirlwind of fall premieres. A steady diet of Under the Dome just ain’t cutting it; you’re not in the mood for the consistently dour and wholly pretentious episodes of The Leftovers collecting dust in your DVR; the thought of spending one more second with Marco and Sonya from The Bridge makes you want to find one and take a header yourself. What’s a TV addict to do? Fear not, friends and neighbors, for it is time for me to unveil to you five television shows that may have previously passed you by but are totally worth binge watching. When a show is great, you’ll want to gobble up as many episodes as possible. Some people will decry that this Netflix-inspired model of television consumption plays into our societal need for instant gratification, and to that person, I say…you’re probably very likely onto something! But you know what? Who cares? Quality is quality is quality, and life’s too damn short. So without further delay, five shows worth binge-watching. It’s likely the most emotionally devastating series ever to hit the air, and guess what? That’s a good thing! For a show that opens each episode with a death, there’s something positively life-affirming about this brilliant series. The Fishers are one of television’s best families, so even when the show descends to darkness (and, wee doggy does it), Ruth, Claire, David, Keith, and–to a lesser extent–Nate are there to guide us through. When you finish all five seasons, you’ll emerge with a new perspective on life, and that’s not an overstatement. Oh, and if you need one more excuse to dive in, SFU boasts (warning: opinion approaching!) the single greatest series finale in the history of television. Emotionally resonant, bitingly funny, and genuinely contemplative, Six Feet Under will never leave you. A masterclass in serialized science fiction storytelling, Orphan Black uses its two ten-episode seasons to unfurl a narrative that draws you in deeper with each passing installment. I’ll be honest, I just finished season one and find myself clambering for the second. Tatiana Maslany, she of the irate Emmy snub, wows as Sarah. And Cosima. And Helena. And Katya. Et cetera. It’s a series that you need to experience yourself; even the most basic of plot synopses will take away from the journey, so dive in and marvel at BBC America’s brilliant Orphan Black. Don’t laugh at me. Or do, I don’t care. Because the fact is: Shonda’s DC drama about political fixer Olivia Pope knows exactly what it is and succeeds wildly in its ability to weave a season long arc that will have you pulling a straight-up Clockwork Orange on yourself as you speed to the finish line. In its attempt to be as apolitical as a political show can be, it becomes clear that Scandal‘s not here to change any minds–though jabs do pop up now and then, directed at very deserving facets of the DC machine. Entertaining you is Scandal‘s chief reason for existing and with its high-stakes storytelling and compelling performances (Oh, hi there, Joe Morton, you menacing rapscallion you), there’s no shame in climbing aboard this runaway freight train of a series. Bryan Fuller, of Pushing Daisies –another show worthy of binge-watching come to think of it–fame, goes for broke in his one of a kind crime series. You might be thinking: do we really need another Hannibal story? And the answer is no we don’t need another but we do need this one. Hugh Dancy and Mads Mikkelsen spellbind as Will Graham and Hannibal “The Cannibal” Lecter. I’m shocked that this show airs on NBC. Not only does it consistently push the envelope for what network television can depict, but it remains psychologically astute and genuinely disturbing. Not for all tastes (ha! cannibalism puns! ), Hannibal is nonetheless a delectable treat (ha! can’t stop me now!) for fans of crime shows looking for something a little different. NCIS and CSI this show ain’t. Thanks for reading! Any shows you’d readily label as binge-worthy? Sound off in the comments!